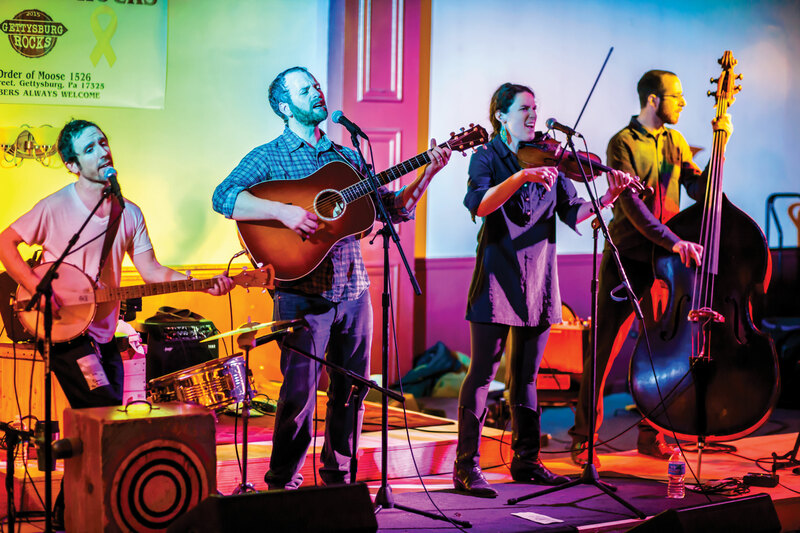 From bluegrass to classic rock, Gettysburg is raising the bar for local music. Phipps believes that Gettysburg is an unadvertised epicenter of culture, for live music especially. “There is a tourist-type vibe that brings people here from all over the world,” Phipps says. “But, there’s more than just the historic angle.” Gettysburg’s live music scene offers events that extend beyond the typical summer tourist season, inspiring locals and residents of surrounding towns to visit Gettysburg and participate in the local economy, even in the off-season. Reid’s Orchard & Winery began hosting live music events in the summer of 2012 at their Home Winery location. “We had a good deal of success with that, and when we moved our Gettysburg location to 400 Baltimore St. in the summer of 2013, we added music dates at that location as well,” says Suzanne Keating, events coordinator for Reid’s Orchard & Winery. The atmosphere that live music provides at both of the Winery’s locations, in combination with the gorgeous scenery, fresh produce, and delicious wines and ciders, adds an extra boost to the wine experience. “Most of our music tends to be low-key singer-songwriters, so it is a relaxed atmosphere, and people can feel free to bring their children, pets, and friends and unwind,” says Keating. The Winery has hosted live music acts from a variety of different genres—blues, rock, progressive, acoustic, classical, rock, oldies, and bluegrass, to name a few. “We’ve had big shows and small, but fun has always been the theme regardless of the genre,” says Martin. Classic rock seems to be a fan favorite so the Winery tries to book some form of classic rock at every opportunity. The 2016 Groovin’ on the Grounds Concert Series will consist of four afternoon/evening events, and a different style of music has been booked for each inexpensively ticketed concert. Concerts are held on Saturdays from 4-7 p.m. throughout July and August. The Winery will continue to host its Live on the Terrace events every other Sunday, which include free admission and live music provided by local musicians of many different genres. Bluegrass fans and former owners of Granite Hill Camping Resort from 1972-2002, Joe and Lil Cornett thought that their property was perfect for a festival. The first Gettysburg Bluegrass Festival was held in early May of 1979. “From  forward, we have promoted the Gettysburg Bluegrass Festival semi-annually every year with the exception of 2000,” says Winkelmann, current owner of Granite Hill Camping Resort. The festival was originally a two-and-a-half-day event, running from Friday evening through Sunday. As the festival established itself and attendance increased, the schedule was expanded—to the current four-day event. Over the years, a virtual ‘who’s who’ of bluegrass music has graced the stage at Granite Hill, including Bill Monroe on his 75th birthday, Dr. Ralph Stanley, Josh Graves, Charlie Waller, Ricky Skaggs, John Duffy, guitar legend Tony Rice, and Alison Krauss & Union Station. “My wife, Cyndie, and I purchased Granite Hill in 2002 and continued to operate the festival in a family-friendly style while making improvements to the services and amenities,” says Winkelmann. August 2017 will mark the 75th Gettysburg Bluegrass Festival including a variety of exciting events celebrating this big anniversary. After opening the Garryowen Irish Pub on Chambersburg Street in June of 2007, Kevin and Joanne McCready made it a priority to host live music events. Known for their collection of more than 50 Irish whiskeys and perfect Guinness pours, Garryowen’s guests can also enjoy fine dining, casual pub fare, and some of the best live music in the area. Garryowen hosts live music events weekly, with an updated schedule available on their Facebook page, website, and as advertised on flyers around downtown Gettysburg. GO Too, Garryowen’s upstairs addition, also hosts private parties, live music, and special events.